We need to allow new construction near our transit stations to encourage more growth in our region. Get In the Loop on all the latest local, national and international transit headlines. Chicago has some of the nation’s greatest economic assets: a well-educated, cosmopolitan population; a diverse set of industries with connections to the rest of the world; and renowned freight and passenger transportation links. Unfortunately, those assets have been insufficient to produce quick population growth, either at the urban or regional levels. Compared to cold-weather Midwest peer regions like Minneapolis-St. Paul, Chicagoland is growing slowly. We must find new ways to encourage growth to expand our competitive edge. One of the primary reasons why homes in many of Chicago's neighborhoods are so expensive, and why population has declined, is that zoning has limited the construction of new housing units. One of Chicago’s greatest—but too often undervalued—assets is its transit network, a system of trains and buses that carries almost 2 million riders each day. Our transit system differentiates the region from most others in the U.S. and is a considerable pull not only in bringing in young people who want to live a car-light lifestyle, but also for companies looking to attract a bright workforce. Communities built intentionally around transit feature lower transportation costs for local residents, vibrant local retail environments and higher numbers of pedestrians and bicyclists. Transit-oriented neighborhoods in the city of Chicago are in demand but are still losing population because of insufficient new housing construction. The City has taken a number of proactive steps to encourage more development near transit and by overcoming additional zoning barriers, can direct more new development to neighborhoods where transit is most accessible. Many of Chicago’s neighborhoods have transformed dramatically over the past few decades. As recounted by writer Alan Ehrenhalt in his recent book The Great Inversion, the Sheffield neighborhood in the heart of Lincoln Park on the North Side has been particularly altered by demographic change. Sheffield in 1970, according to Ehrenhalt, was beset by gang activity and its median family incomes were below the national average. Today, the environment has radically changed. Because of the investment that only seems to come with gentrification, Sheffield’s median incomes are now up to four times the national average and violent crime is very low as compared with other city neighborhoods. It is now one of the most desirable places to live in Chicago. Not only does it have an excellent building stock and easy access to Lake Michigan, but perhaps most importantly it has great bus and rail access that provides its residents quick access to the Loop’s hundreds of thousands of jobs. It is a prototypical transit-oriented neighborhood. Unfortunately, it’s also a place that fewer and fewer people are able to call home. Gentrification brings investment, but it also brings higher rents and prices. Writing in Crain’s Chicago Business in March, Daniel Kay Hertz pointed out that Lincoln Park as a whole has lost 40 percent of its population since 1950, declining from 102,000 people to just 64,000 today. Over the past decade, its population barely budged. The problem is not that people don’t want to live there—indeed, with median rents of $1,750 for a one-bedroom apartment, according to one listing service, Lincoln Park is one of the most desirable areas of the city, and landlords are pricing their apartments accordingly. The problem is the opposite: Many people have been priced out. Lincoln Park is hardly alone, as the following graph demonstrates. 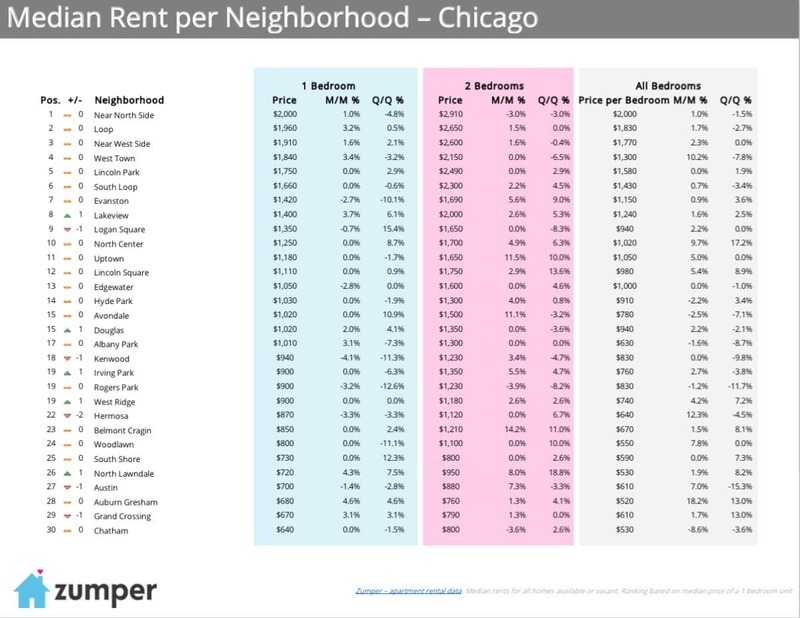 In Lakeview, Lincoln Square, Logan Square, North Center and West Town—five neighborhoods in Chicago’s North and Northwest Sides—median rents and household incomes (inflation-adjusted) increased dramatically between 2000 and 2010. At the same time, the number of housing units in each of those communities increased by far less, and population dropped in all of them. Each of the neighborhoods is transitioning to a wealthier overall population able to afford the higher rents, even as the city’s median income was basically unchanged over the same period. Because the number of housing units being added to those communities has barely increased, the population falls because wealthier families tend to have smaller family sizes and the general expectation for acceptable dwelling size has increased. For example, in Census Tract 703, which extends from Fullerton Parkway to Diversey Avenue along Halsted Street, the average household size declined from 2.7 people in 1970 to 2.1 in 2010—a 22 percent reduction. So why are Chicago’s vibrant, transit-oriented communities that are attracting people still losing population? People who want to live in these areas but cannot afford high-price homes instead often choose to move to new suburban communities, which results in more traffic congestion and higher transportation costs, not to mention encouraging construction on previously undeveloped land. Living in a place where destinations and amenities are spread out requires residents to spend far more on transportation than their urban peers. Those who don’t want to live in these suburban communities but can’t afford to live in transit-oriented areas in Chicago choose to move to other parts of the country. One way to encourage more people to move into our region—and to keep them here—is to make sure that more people can live in in-town, desirable areas. As I’ll describe later in this article, one of the primary reasons why homes and apartments in many of Chicago’s neighborhoods are so expensive, and why population has declined, is that zoning has limited the construction of new housing . Limitations on supply and high demand mean, according to basic economics, higher rents. One way to address the important goal of growing Chicago’s population is to ensure that constructing more units is not only possible, but encouraged. Recent changes in these relatively upscale communities are part of a long-term trend in the Chicago region. Over the past 60 years, the share of the metropolitan area’s population living within walking distance of rail transit stations—meaning Chicago Transit Authority El or Metra trains—has declined precipitously. As the following graph shows, the share of people living within a half-mile of those stations has declined from more than half of the region’s population to just 22 percent today. This decline is the result of a host of policy and societal changes, many of which occurred in regions across the U.S. over the same time period. People responded positively to large, single-family homes available in the suburbs and made it part of the popular conception of the American dream. The U.S. government supported a massive investment in the nation’s Interstate Highway System, which allowed fast movement by cars and bulldozed through inner-city neighborhoods in many cities, including Chicago. The federal government provided cheap loans for new housing constructed on vacant land outside of the city. And investment in transit sputtered; indeed, the mileage of rapid transit rail lines in the Chicago region is lower now than it was in the 1950s (more people rode transit in the Chicago region in 1980 than in 2014, despite a population that is much larger). But the decline in the share of the region’s population living near transit also is a consequence of municipal policy choices that have led to population loss in neighborhoods such as those profiled above. By limiting housing construction in these communities, the Chicago region will inevitably become more reliant on automobiles, resulting in more congestion and pollution. Despite all this, the city of Chicago itself has remained transit-oriented, which explains the fact that it is one of the few major U.S. cities where only half of the workforce commutes by car. By comparison, in Atlanta, Detroit, Minneapolis, New York and Seattle, 68, 70, 62, 22 and 52 percent of commuters, respectively, commute by car. The extensive rail transit system provided by the Chicago Transit Authority and Metra puts more than half of Chicago’s residents within a half-mile, or about a 10-minute walk, from a station, as shown in the following graph, despite the fact that 58 percent of the city’s parcels are farther than a half mile from a station. Employment is even more tightly concentrated near transit; about 80 percent of the city’s jobs are within a half-mile of a rail station. These characteristics are not true of the region as a whole, where the large majority of housing and jobs are far from transit. Chicago’s extensive transit system offers an excellent opportunity to build on one of our region’s strengths, which is access to jobs, entertainment and other needs via bus or train—something few metropolitan areas can provide. But we must have the appropriate zoning framework in place to ensure that it is possible to build adequately near stations. In 2013, Mayor Rahm Emanuel and the Chicago City Council took a major step forward to reward new construction near Chicago’s major public transportation facilities through the transit-oriented development ordinance. This ordinance provided incentives to encourage denser, less car-dependent uses on land within 600 feet of a rail station (or a little less than one “long” Chicago block) or within 1,200 feet (a five-minute walk) when buildings are situated on a City-designated Pedestrian Street. The following map illustrates parcels in the city where the ordinance allows either increases in density (slightly bigger buildings) or reduced parking requirements. Source: MPC calculations based on City of Chicago's TOD ordinance. Note: This map is for reference only. Zoning and other mapped information is not guaranteed to be current or accurate. View this map full screen. For specific types of parcels, the ordinance reduced the parking requirements for new housing construction and eliminated it for commercial or industrial uses, encouraging developers to respond to the fact that many people living near transit simply do not need to own a car. In addition, the ordinance made it possible to build bigger buildings with more housing units on some parcels, as long as projects taking advantage of this incentive were reviewed by the community and approved by the relevant alderman. The transit-oriented building recently completed at the Division Blue Line station. The ordinance has already successfully encouraged transit-oriented development, particularly in areas on the city’s North and Northwest Sides, generally within about five miles of downtown and along the Blue, Brown and Red El lines. About 10 projects, typically with multi-family housing and retail, are under review by City officials. According to MPC’s analysis of Chicago’s open data, about 63 percent of the City’s subsidized affordable housing units are within a half-mile of rail transit stations, a higher proportion than the city’s population as a whole. In addition, private developers are focusing their investments in areas near transit, as the following graph shows. Since 2004, 65 percent of new construction building permits have been in areas within a half-mile of stations, indicating that investment is streaming to these areas, which makes sense given that people are increasingly looking to live and work near transit. But there is more work to be done. One of the major causes of inadequate housing growth in the neighborhoods mentioned above, and with several others located around the city, is that new buildings with significant additional units are often not allowed under the zoning code, which regulates what kinds of buildings can be built, and where. The zoning code defines how big of a building can be built on most parcels using a metric called floor area ratio. A 10,000 sq. ft. parcel with a floor-area ratio of 2, for example, allows 20,000 sq. ft. of built floor area; this could allow for a two-story building with 10,000 sq. ft. per floor, a four-story building with 5,000 sq. ft. per floor, or a number of other possibilities. A ratio of 4 would allow twice as much development. The vast majority of parcel land in Chicago is zoned to allow floor area ratios of less than 5, as shown in the following graph. In particular, areas more than a half-mile from transit are zoned to allow low levels of development, with more than 60 percent of land dedicated to ratios less than 1. Appropriately, the city’s zoning code generally encourages bigger buildings closer to transit stations. Even within a quarter-mile of rail stations, however, more than half of land is zoned to ratios less than 2, which means about two stories in a dense urban neighborhood. As a result, the ability of developers to build new projects to respond to the public’s growing desire to live and work near transit is limited. In downtown areas such as the Loop, West Loop, South Loop and River North, developers are able to build tall buildings. As shown in the following graph, more than 90 percent of parcel land near transit in the downtown area is zoned to allow FARs of 10 or more—which is one of the reasons why so many towers seem to be popping up in the central area. Indeed, all that new construction is one reason why the central business district now accounts for about as many jobs as the rest of the city combined, a big change from 25 years ago; and why downtown Chicago’s population doubled between 2000 and 2010, even as the city as a whole lost population. In other parts of the city, however, land near transit is overwhelmingly zoned to allow floor area ratios of 3 or less. That means that developers who want to build—and people who want to live and/or work in—relatively dense residential or commercial buildings in the neighborhoods are frequently blocked by unfriendly zoning regulations, even right next to stations. The transit-oriented development ordinance improved this environment for some parcels, providing a roughly 20 percent increase in allowed floor area ratio for developments in commercial zones. This has produced incremental progress; however, because of pre-existing zoning, the large majority of land does not qualify for those incentives. Zoning rules not only limit the size of new buildings constructed in areas near transit, but they also control what types of buildings are built there. As the following graph shows, in areas of Chicago both near and far from rail stations, the plurality of land is devoted to residential uses only. On such land, the possibility of a mixed-use building, such as one with retail on the ground floor and apartments above, is restricted. Even in areas closest to stations—within a quarter-mile—only about 20 percent of parcels allow a mix of housing and commercial uses (the business, commercial and downtown zones in the following graph). Effective transit-oriented development encourages a mix of uses to maintain a density of housing, jobs and community amenities. Zoning should be designed to reflect that goal. The City’s work to ensure that its affordable housing investments are concentrated in areas near transit is one approach to ensure that new construction in these areas is equitable. Other City policies, such as the Affordable Requirements Ordinance, offer the potential to encourage new affordable units in market-rate buildings. For example, the new building planned near the California Blue Line Station at 2293 N. Milwaukee Avenue, which was approved unanimously by the Chicago Plan Commission, will include 21 units dedicated for low-income families. Moreover, research at the national level demonstrates that allowing increased construction lowers housing costs. In Washington, D.C., where significant new housing construction has been authorized over the past few years, the increase in supply is pushing rents down, according to market research firm CoStar. Making sure that our region is able to respond similarly should be a civic priority. The Metropolitan Planning Council is working with the City of Chicago and a number of other partners to strengthen the City’s regulatory incentives for transit-oriented development. With one of the nation’s most extensive and well-used public transportation systems, Chicago has the opportunity to encourage denser development with easy access to transit in more neighborhoods. In the process, we have the opportunity not only to make transit-oriented communities more accessible to a wider population, but also to make our region more appealing and jumpstart its currently tepid growth.